Located on the Cache la Poudre River, Fort Collins is the county seat of Larimer County and is also the fourth most populous city in all of Colorado. It sits in the northern section of the state, a short drive away from both Denver and the border with Wyoming. Fort Collins trails only Aurora, Colorado Springs, and Denver in terms of its population, with approximately 165,000 people calling the city home. The city itself stretches out across approximately 57 square miles and has a high elevation due to its location on the Colorado Front Range, not far from the Rocky Mountains. As the name suggests, Fort Collins was originally founded as a fort for the United States Army back in 1864. A military camp named Camp Collins had already been set up in the area, but floods had caused some damage in the area so a fort was built a little further downriver. Only a few years after being constructed, the fort was decommissioned, but many settlers came to the area, setting up a school and church as early as 1866. Sheep farming and stone quarrying were the main businesses of the town, and Colorado Agricultural College, which would later become Colorado State University, was also constructed. In the years that followed, the city continued to grow into a key hub for the state of Colorado, with more buildings and businesses setting up in Fort Collins, and the university becoming one of the state's most important educational institutions. Nowadays, with Colorado State attracting thousands of new students each year, Fort Collins is regarded as a college city. The elevation of a town or city is a geographical indicator that tells us how high or low that place is in relation to sea level. The elevation of Fort Collins is 5,003 feet (1,525 m), which is very high when compared to many other large cities around the United States, most of which tend to be situated at elevations of 500 feet (152 m) or less. The high elevation of Fort Collins is due to its location along the Colorado Front Range. Towns and cities in this area tend to have elevations of at least 5,000 feet (1,524 m) in general. Colorado residents are used to living at high elevations in general as the state is actually classed as the highest one of all. Colorado has a mean elevation of 6,800 feet (2,070 m). The highest city in Colorado is Leadville, which sits in Lake County in the central part of the state and has an elevation of 10,152 feet (3,094 m). Meanwhile, the highest point in all of Colorado is Mount Elbert, which has an elevation of 14,400 feet (4,401 m), while the lowest point is the Arikaree River, which has an elevation of 3,317 feet (1,011 m), which is still higher than many other locations around the United States. So how does the elevation of Fort Collins compare with other major cities around Colorado? In general, Fort Collins has a lower elevation than other big cities. The state capital of Denver, for example, has an elevation of 5,280 feet (1,609 m), which is just a small amount higher up than Fort Collins and helped to earn Denver its “Mile High City” nickname. 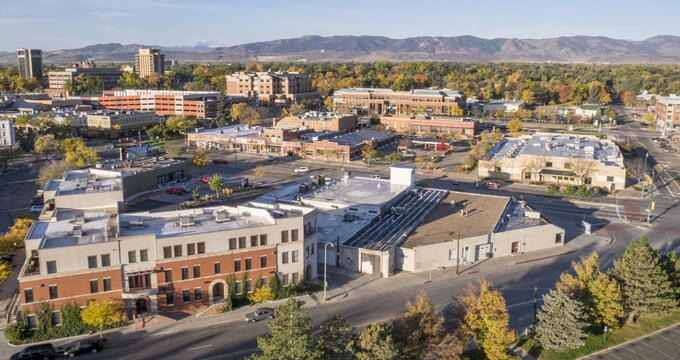 Other major Colorado cities include Colorado Springs, which has an elevation of 6,033 feet (1,839 m) and Aurora, which has an elevation of 5472 feet (1,668 m), so Fort Collins’ elevation is lower than both of these areas too. Fort Collins has a semi-arid climate, which is strongly influenced by its high elevation. The higher one goes, the colder the air gets and the more likely it becomes to experience low temperatures and snow. The city of Fort Collins can see plenty of snow through a typical year, with over 50 inches falling on average. Temperatures do warm up through June, July, and August, with average of 71°F (22°C) in July, but the air becomes a lot colder through fall, winter, and spring. January is the coldest month with averages of 29°F (-2°C). Due to its status as a college town, a lot of the lifestyle of Fort Collins caters to young people. Bars, restaurants, music festivals, live shows, and more can be enjoyed around Fort Collins, and the city is also known for its thriving microbrewery sector, with a lot of different craft beer companies all around the city and the Colorado Brewer's Festival being held in summer of each year. Other attractions and activities in Fort Collins include the Colorado Marathon, the Fort Collins Museum, and The Gardens on Spring Creek.